Myth 23: You housetrain a pup by rubbing his nose in it when he has an accident in the house. This is an old-fashioned myth that many of us are brought up with. Many people know better at this point, but many well meaning people do still believe in this myth. 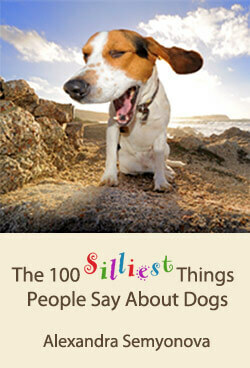 Since I still run into it very often, I have to mention it in this book — for the sake of puppies. Dogs (and cats) have a natural tendency not to dirty their core living area — the places where they play, sleep and eat. This natural protection against the transmission of disease and parasites is already present at birth. In the first four weeks of his life, a pup can’t relieve himself until his mother pushes him onto his back and begins to lick his groin. This massage stimulates the bladder and colon to empty themselves, and the mother consumes what they produce, thus keeping the nest clean. The pup isn’t able to relieve himself independently until the end of his fourth week, when he’s become strong enough to crawl away from the sleeping area to do so. From this point on, the pups start to deposit their waste further and further away from the nest they sleep and play in. For the rest of his life, an adult dog will not dirty his sleeping area (unless he is confined and ends up with no other choice). You are on holiday in Russia, and you have just been to the toilet in your hotel’s lobby. You are on your way out of the lobby. The cleaning lady runs after you, grabs your sleeve, and starts yelling at you in Russian. Everyone is staring at you as the angry cleaning lady leads you back to the bathroom. Once there, she stands there talking angrily at you and gesturing at the toilet cubicle you just used. You have obviously done something wrong. Was it the empty roll of toilet paper you failed to replace? Was it the light you didn’t turn off? Did you perhaps leave brown stripes behind, or were you supposed to use some other cubicle altogether? Before you look at the answer at the end of this chapter, think about how this would make you feel. You meant no harm, and you do your best (next time replacing the empty roll or turning out the light, and using a different cubicle each time you go), yet this keeps happening to you every time you use the bathroom. You just can’t figure out what mistake it is you’re making. In the end, you become afraid to use the bathroom in the hotel at all, or you try to do so only when you’ve checked to see that the cleaning lady isn’t around. Once you’ve let it sink in how this would make you feel, you are allowed to look at the answer on the following page. A pup means well, but he needs our help to know what we want him to do (it’s no use yelling at him in what is, to him, Russian). What you need to do is carry him outside frequently, so he gets the opportunity to do the right thing. When he does do the right thing in the right place, you reward him instantly with some delicious titbit and lots of squeaky-voiced praise. Besides taking him out about every two hours, you also need to carry him outside an extra time just after he eats, when he’s just woken up from a nap, and just after a session of enthusiastic play (these are moments when most pups will suddenly feel a need to go). If he has an accident in the house, the best thing is to ignore it. Rather than getting angry with him, just clean it up — and see it as a learning experience for yourself, that you need to be more alert to the signs that he’s feeling the need. When you can’t keep an eye on him (not to punish a mistake, but to see his signals and help him do the right thing before it’ s too late and he loses it), you can confine him to his sleeping area — his crate, or a large cardboard box he can’t climb out of. He will do his best to hold it, reluctant to dirty an area just big enough for him to lie down in. But don’t leave him there too long, because if he is forced to dirty this tiny area and then lie in it, he will start losing the natural tendency to try to keep the living area clean! Our intention here is to help him avoid mistakes, and to be able to reward the right thing as frequently as possible. If you do this, it won’t take more than two or three weeks for him to understand where he’s supposed to go. But we aren’t finished yet. Knowing where he’s supposed to go is one thing, always being able to do it that way is another. A puppy’s sphincters aren’t fully developed yet. He won’t always have the strength it takes to hold himself. His brain is also still growing, including the parts that control the sphincters. To his dismay, the pup finds that his body sometimes does what it will, and that he can’t hold it no matter how hard he tries. A lot of pups make it through the day all right, when they’re taken out every few hours, but still aren’t able to hold it all night yet. He may start to squeak or squeal in the middle of the night. Try not to get irritated. Remember that he’s small and helpless, he can’t get out of the box, can’t open the front door himself, his body can’t hold it so long yet, and he is asking for your help so he can do what you want him to do. Again, if you force him to dirty the area he sleeps in, you may be creating a dog that will never be housetrained, because his growing brain will be storing the wrong signals. So help him, even in the middle of the night. It won’t be forever. Within another week or two he’ll be able to get through the night, and by the time he’s three months old, you’ll have the Totally Housetrained Pup. Fact: When you punish a pup for accidents in the house, you’re actually punishing him for being small and helpless. Never forget that your puppy is a baby, and that he genuinely does want to do the right thing. He needs our help, and doesn’t deserve our anger. Answer to the riddle: I bet you couldn’t guess this one. In Russia, no one flushes toilet paper down the toilet because this tends to block the generally ancient plumbing. The cleaning lady knows you did it wrong because (if everyone is lucky) the paper doesn’t go down after the first flush. It floats around in the hole a while first. Toilet paper must be deposited in the wastepaper basket next to the pot. It’s considered bad manners and very inconsiderate to do it any other way.